Or everyone can keep quiet about that. 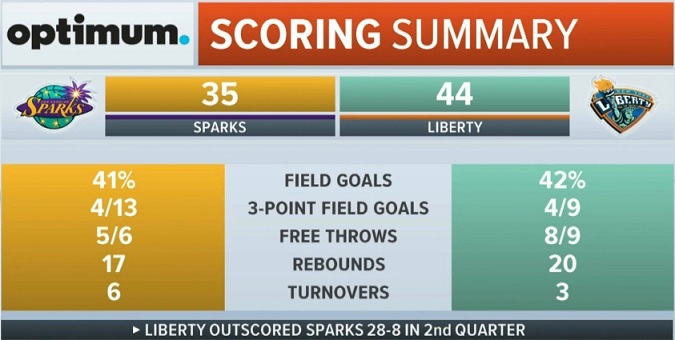 Liberty go on a 9-0 run thanks to Prince. no. should thank parker for screwing around. Whats up with nneka ? Last 2 games shes really been lackluster. Yeah i know she made the closing bucket against the lynx again but she seems to be just #Fitting in like she did her first yrs in LA! Wtf ? She also gets away with O-foul bulldozing almost every time she gets the ball. I think they said she was shooting when she got fouled, then shot again and made it the second time. That's the only way it would make sense. We better be quiet about it before ClayK hears us posting about them. Even Bill, whose team was kind of benefiting, was like "Da fuq?" Sparks only score 8 points that quarter after their hot shooting in the 1st. Liberty counter with a 20-0 run. Nice work, Liberty!! Though I didn't care for Tina playing all 20 minutes that half. Why do the Sparks have this tendency to lose focus defensively in second quarters of games this season? Are they gonna balance their 2nd quarter follies with still another lock down effort in the third? There is someone on the baseline with enormous hair and a Bob Marley shirt who looks an awful lot like Cappie Pondexter, is getting recognized by an awful lot of people, and is signing autographs and taking pictures. I don't know if it's her or not, but it'd be pretty funny if it was. Cappie is at the game and sitting on the baseline next to the Liberty bench. So if that's where you are seeing all of this, then it's her! Sparks look gassed. no energy. Libs should attack Nneka on offense. Dare the refs to call her 5th foul. I bet they won't. Parker continuing to throw up bricks and now air balls from 3. Bill needs to take Tina out for 2 minutes. She's looking tired out there.